Just two days before opening the Ilkley Literature Festival ‘Fringe’ show of local writers’ club Writing on the Wharfe, one of Menston’s favourite singer-songwriters – Emma Nabarro-Steel – launched her album ‘Leaving a Space‘. It will be no surprise to visitors to the Menstone club for the monthly ‘open mike’ night that it is just beautiful. The album can be downloaded from streaming sites like Spotify, or ordered as a CD – see below. 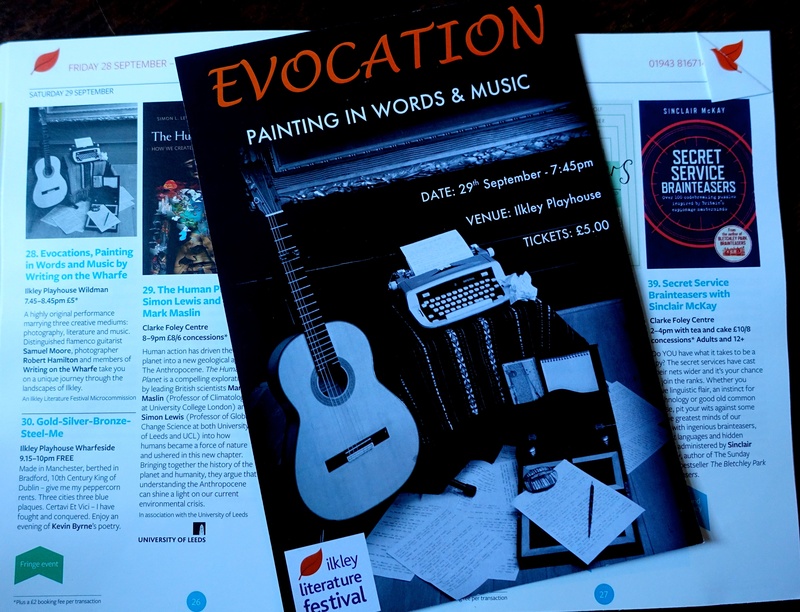 Emma, who is a member of the writers’ club as a writer of lyrics, will be performing a couple more of her songs amid short stories, poems and story-telling with pictures from other members during an hour long presentation at the Ilkley Playhouse on Monday evening (3 October, 9pm). As with all ‘Fringe’ events, entry to the show is free. There’ll be poems from Marjorie Hanbridge (known in the club as ‘Menston’s own Pam Ayres’) and David Machin (well known to children at Menston Primary School), short stories from Becky Bond, Kelly McCarthy-Wright, Dan Brassington, and club founder Ruxandra Busoiu, a very short short story and some very short ‘poems’ (haiku) from Roger Livesey, and a narration around the superb street photography (all shot in Shipley market place) by Bob Hamilton. The show will end with audience members being invited to write the last line of a short story, hence the show title: ‘Help! We’ve lost the plot …’. If you’d like a taster, go along to the show on Monday evening. For more details about the writers’ club, email rbusoiu@yahoo.co.uk or come along to the show and speak to Ruxandra and other club members in the bar after the show. Menston will be well represented during the Ilkley Literature Festival, opening on Friday this week, by the local writers’ club which meets regularly at the Menstone club in Farnley Road, and by local artist and photographer Justin Leeming. 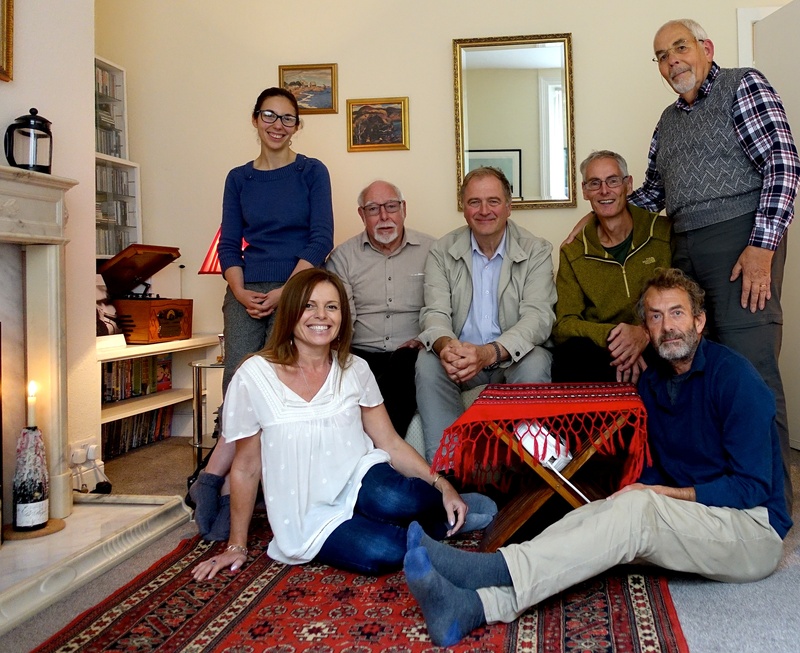 The writers’ club, Writing on the Wharfe, will be doing a one hour ‘fringe’ show at the Playhouse on Monday 3 October, 9pm-10pm, featuring the short stories, poems, songs and photographs of members, five of whom live in Menston. They will also be asking audience members to write the final lines of a short story. All fringe events are free. Members of ‘Writing on the Wharfe’ following a meeting to finalise their programme for the ILF ‘fringe’. l to r: Becky Bond, David Machin, Emma Nabarro-Steel, Bob Hamilton, Ruxandra Busoiu, Roger Livesey, Marjorie Hanbridge, Kelly McCarthy-Wright. Another member, Dan Brassington, will be joining them for the fringe performance. A couple of days before the show, on 1 October, Menston singer-songwriter Emma Nabarro-Steel will be launching her album Leaving a Space. There’s a taster on youtube. Justin will be exhibiting some of his paintings and prints, for sale, as part of the Art Trail which runs from Thursday 30 September to Sunday 2 October at venues throughout the town. Details on the website http://ilkleyarttrail.co.uk/.